Last year the campaign collected 45 tonnes of non-perishable items and helped 20,000 families throughout 2015. This year Wesley Mission Victoria is aiming to bring non-perishable food donations front of mind with the public by demonstrating how they can become important meals for families in need. Okay, so I hear you asking what do you classify as a non-perishable item. It is everything apart from the fresh and frozen food aisles in the supermarket. Here are some examples of non-perishable food items: Any tinned fish, pasta, rice, jars of vegetables (capsicum, etc. ), jars of olives, couscous, soups and there is so much more. As I was putting together my recipe and having a few wanders around the supermarket, I came upon Lite Cooking Cream on the shelf. I didn’t know that existed as I have always ventured straight to the cold dairy section and bought fresh cream. I was very happy to find another alternative to fresh cream! 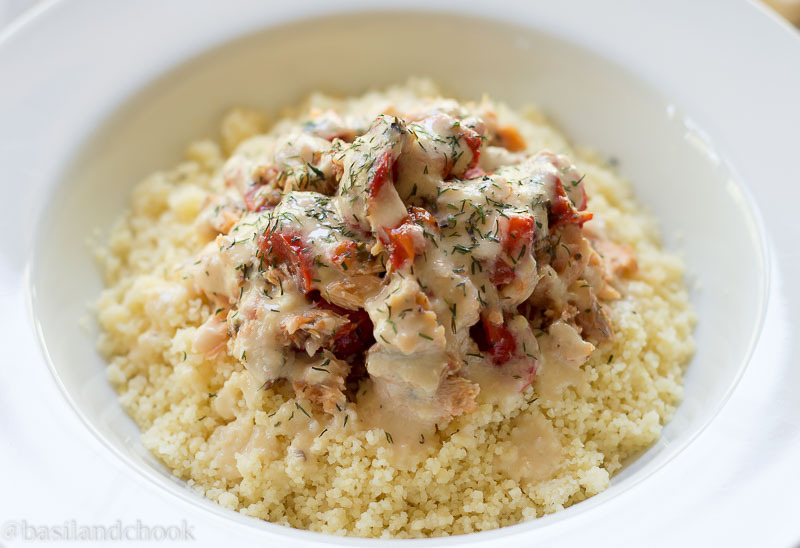 So now I would like to share with you the recipe for this delicious Couscous and Salmon with a Creamy Mustard Sauce. And yes it all came together using only non-perishable food items! In a medium frying pan add the oil, granulated garlic and onion powder and gently heat through on a low to medium heat. Add cream, Dijon mustard and lemon juice. Bring to a gentle boil then gently simmer until sauce reduces and thickens slightly. While the sauce is simmering, in a small frying pan add the salmon and capsicum. Gently heat through. Don't break up the salmon too much as you still want chunky pieces. 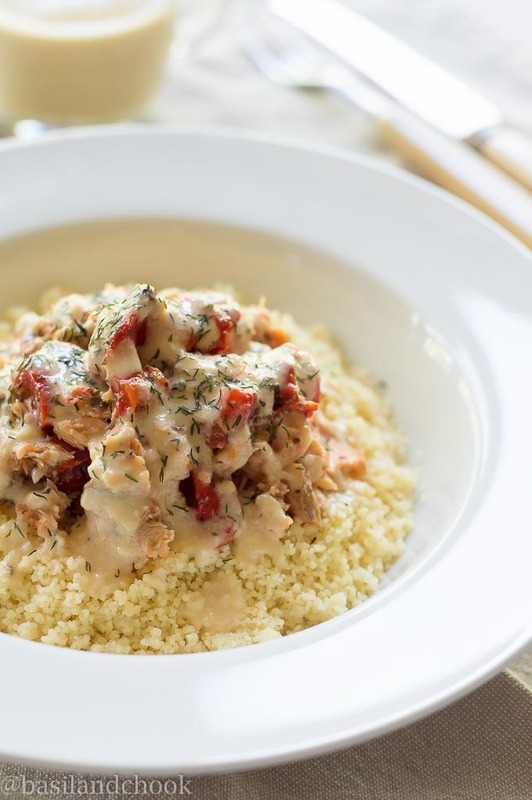 In a large saucepan, make the Couscous according to the directions that are on the packet. 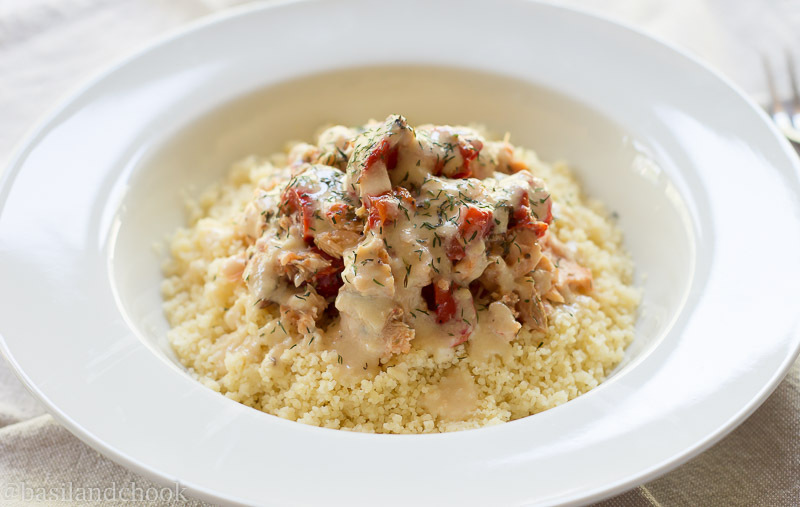 Serve up the Couscous then place the salmon mixture on top. Drizzle the creamy mustard sauce over the salmon then sprinkle some dill on top. 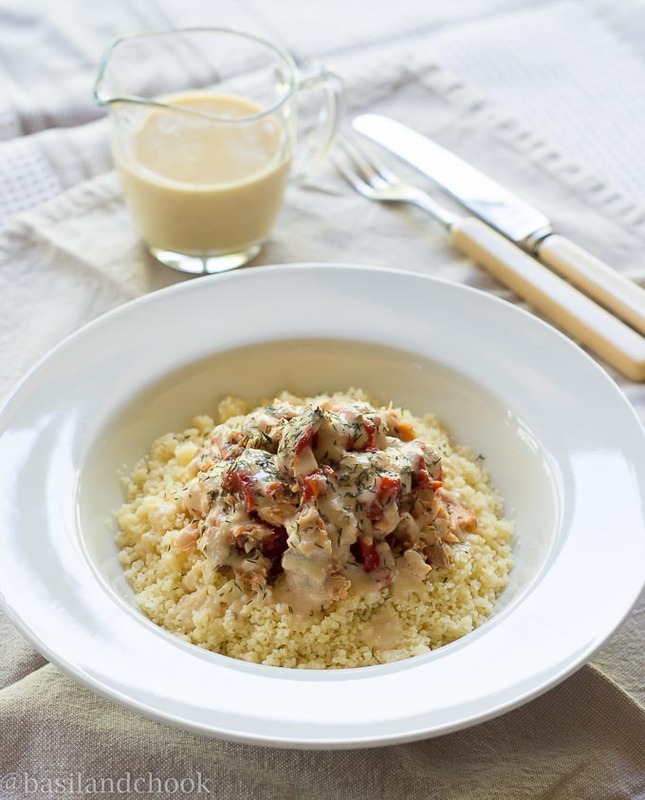 After perusing the supermarkets to find ingredients for this recipe, I found that there is a large selection of non-perishable food items that you can make great nourishing and delicious family weekly meals with – it’s not all just baked beans and tinned fruit! I would love you to give this challenge a go. Put your chef hat on and get creative in the kitchen. What delicious family meal could you make with non-perishable food items? You will be surprised what you will find on those supermarket shelves! Thanks for your support Simone, and what a great recipe! Tinned fish is a really popular choice for families who come to our homelessness support services because it is so nutritious and versatile. You’ve also created something that could be a lifesaver on a Friday night when fresh ingredients are running low and we look to the pantry for inspiration. This is so great that you are focusing on this subject, especially this time of year! So many families really can use the help. And this is such a brilliant use of non -perishible items to make a fabulous meal. Well done!